Make your job easier and help a horse in need! Have you ever tried to carry flakes of hay, only to have them spill all over (including on your clothes)? I don't know about where you live, but here in Florida, hay is expensive! We really don't like it to go to waste. Plus, with so many chores to do at the barn, you want to make it as easy as possible to feed the horses... so you have more time to ride! The second reason I created this is that I really want to help horse rescues! I know that many of them struggle. So I am donating 10% of the proceeds from each sale to a horse rescue. Once I reach $100 in donations I'll ask my horsecrazy girlfriends to help me pick which one. 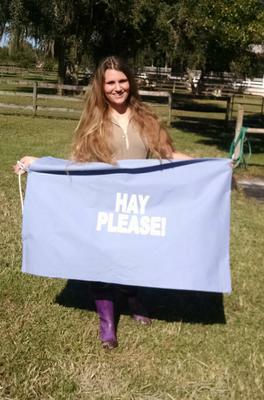 Will you help me get this product off the ground and help horse rescue? 1. Is this something you'd use? 2. Is it something you would buy? 3. Would you pay $35 for it with free shipping?